Save energy and money by adopting effective energy habits. Plug load is the electric usage load from plugged-in devices (excluding heating and cooling systems or larger appliances like refrigerators) on household outlets. It typically accounts for 20 percent of a home's energy usage and includes devices that use electricity while they're plugged in, even when they're turned off (phantom load). You can reduce your plug load by "Climbing the Plug Load Pyramid," helping you take action to save energy and get the most for your energy dollar. New research on Minnesota households shows that as much as 30 percent of the electricity flowing into plugged-in devices is wasted. For more information on steps you can take to reduce your plug load energy usage, view our Guide to Plugged-In Devices. Turn off TVs, lights, radios and other devices when you're not using them. Enable power management on both your monitor and computer to drastically reduce their electricity energy use. Or, properly shut down your computer whenever you aren't using it. When you are away from your home for several days, unplug your electronic equipment (such as TVs and computers) that won't lose essential settings. Every day, use a Smart Power Strip for easy unplugging of computer workstations and entertainment centers. They help eliminate standby power usage (also referred to as "phantom load" or "vampire draw") by preventing devices from using electricity when they're turned off. It also may protect your electronic equipment from voltage spikes (power surges). 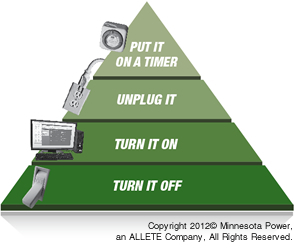 Use a timer for electronic equipment you don't need all the time but want to be ready when you need to use it—things like set-top boxes (e.g., satellite box), computer networking equipment (e.g., routers and modems), and tool chargers. For example, turn off set-top boxes late at night and power them back on early in the morning—they'll recover their settings long before you turn on your TV. 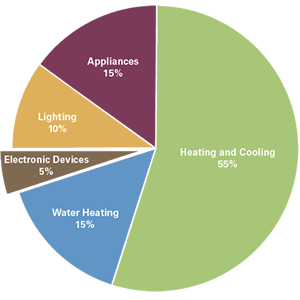 Electronic devices represents 5% of a typical home's energy usage. Take advantage of energy-efficient products, rebates, and tools to save energy and money.